You may wonder at first why this is not a good question to ask on the phone. Asking the caller if they are a patient is OK if they are not a patient, but can be quite insulting if they are a patient. You didn’t recognise their voice and they may have only just been in to see the Dentist a few days ago. Your existing patient may not be feeling the love right now! Acknowledging and recognising your patients on the phone is so important. I know it can be hard to recognise someone by their voice. Most of the time an existing patient will let you know their full name up front. If the caller does not give you their name then asking their name initially is a good way to identifying the caller as an existing patient. Or you could ask when their last appointment was. If it is a new patient then they will let you know they have not been to your practice before. Overcoming any slight awkwardness when you don’t recognise an existing patient on the phone is easy to handle by apologising. And of course by practicing that apology so that you are ready to give it when needed to. Asking a yes or no question is always dangerous on the phone. If you ask the caller if they would like an appointment at the end of your call, they may say no. Why not presume they have called for an appointment? After all this is usually why they have called in the first place. Always keep in mind on every call that the reason the caller has called you, is to get help. The best way to help the caller is to make them an appointment. Why not let the caller know you can make them an appointment and ask them whether they would prefer morning or afternoon. Make a decision with the caller and then give them the final decision of a morning or afternoon appointment. Help the caller and keep it nice and easy for them. My concern if you ask this question about affordability, is it can start the patient thinking about something they were not even thinking about. Let the patient think about whether they can manage the payment. If they can’t they will soon let you know and then you can offer ways to help make the payment manageable so they can still go ahead with their treatment. At the end of the call when the fee for treatment is covered, ask the caller if they have any questions without asking if the treatment is affordable. At the end of the call as you make the appointment you never ask the caller when they want to come in. You must remember that you have a well-oiled appointment book that needs to function well. You want to be in control of the appointment book when your patients’ appointments are booked in. You do want the caller making the appointment to have some choices with their appointment time. Offer morning or afternoon and then a choice of two times. If the patient then mentions they are restricted on certain days you can work in with that. I have learned over the years that most patients are happy to take the choices you give them so keep it simple with minimal choice and guide them to the appointment that works well for you and them. In a Practice with multiple practitioners you need to be mindful of each Dentist’s production in the practice. Most New Patients don’t mind which Dentist they see and will specify if they do. 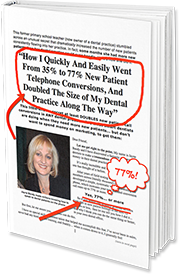 The last thing you want to do is stack up too many patients for one dentist in the Practice because you have given this choice to the caller. Next week I will share with you the Top Five Questions to Always Ask On The Phone.